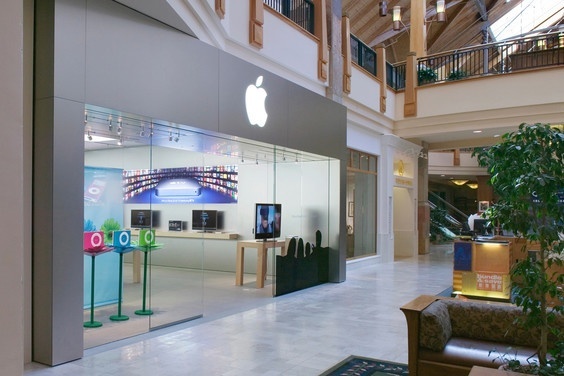 Yesterday, my wife had a truly remarkable customer experience at the Apple retail store in Park Meadows Mall, Lone Tree, Colorado. The experience demonstrates something very interesting about Apple that makes it unique and hard to compete with. My wife, who is now a professor at a local college, was looking for a Thunderbolt (or mini DisplayPort) to VGA adapter for her MacBook Air. This is for in-class presentations with a projector. Instead of sending me on my way, the salesman got onto one of the iMacs, went to the Best Buy website, entered the local ZIP code. [There's a Best Buy across the street from the mall. - JM]. He determined that the Best Buy had what I needed in stock and sent me over there. Sure enough, that Best Buy, which has a great selection of Apple accessories, had that adapter. What that Apple salesman did surprised me! As an added bonus, it was an Apple branded adapter, so Apple still made some money. When I think about the big picture, I can exactly see how an astute Apple salesperson would do what he did. He works for Apple. Apple sold my wife a MacBook Air. He has a stake in his own company's success. Apple previously made the sale of that MacBook Air, making a healthy profit, and the salesperson wanted to make sure my wife had a successful experience using it. That Best Buy made a US$5 profit on an adapter cable was irrelevant to that experience. But the extra time he took to help was very relevant to Apple's success and customer relationship. Just a few days earlier, my wife and I were at a different Best Buy in Denver Metro, and we were looking for a powered USB 3 hub. That store, amazingly, didn't have one, and sent us on our way with regrets. They didn't even offer to look up a product on their own company website and ship it to us. (That's usually a bit of a hassle if you don't have an account already.) I came home and found a very nice one at Other World Computing — where I do have an account. [As an aside, it's awfully nice, and I may review it.] I figured that if it turned out to be satisfactory, returning it to OWC would be a lot easier. Best Buy sales people sell PCs and Apple products, but they're generally not stakeholders in any one company. (Unless they're getting spiffs.) If they don't have what the customer needs, it's an unfortunate inventory problem. If a customer is unhappy with an H.P. PC, they'll smile and refund the money, but ultimately, it's Hewlett Packard's product problem. And because Best Buy has competition for just about any of its many different product categories, taking the time to look up a product on a competitor's website and then send a customer elsewhere is self-defeating. My wife said that if she needs any more help with her MacBook Air, (that I can't help with), she's going back to that same Apple salesman. And if she can't find him, a brief retelling of her story to any of the other Apple sales people will likely result in the same customer experience. Plus, and this is notable, a repeat visit to the Apple store generates even more good will and possible additional sales. Taking the time to look up a product on the Internet, determine availability, then and direct a customer to another local store for an accessory so that the customer can be successful with an Apple product is such an obvious thing to do in hindsight. I wonder how many other companies, straining for every penny of coveted profit, can even be in a position to train their employees to do the same. Apple storefront image via Apple.